Ya Ali Madad. July 2013 is going to be a very busy month for Ismailis because we will participate in two major activities: Holy Ramadan and Imamat Day. In the Muslim calendar, a new month begins at sunset; therefore, Monday, July 8, 2013 is Chandraat and the first night of the Holy Ramadan for Ismailis in Canada. The first physical fast will be on Tuesday, July 9, 2013. A special educational resource section entitled 'Ramadan Resources' is available on the SalmanSpiritual.com to augment your Holy Ramadan experience. The 56th anniversary of our beloved NOOR Mowlï¿½nï¿½ Shï¿½h Karim Al-Hussaini's (a.s.) accession to the masnat of Imamat will be celbrated on July 11, 2013. On the occasion Imamat Day 2013, please accept our heartfelt felicitations! May Noor Mowlana Hazar Imam grant peace, prosperity, happiness, barakat, higher spiritual enlightenment, spiritual & luminous tayid (help) and empowerment to you, your family & Jamat, and the worldwide Jamat. Ameen. Noor Mowlana Sultan Muhammad Shah (a.s.) has taught us that according to the Ismaili tradition, the institution of Imamat is continuous, perpetual and everlasting. The Imam of the time is the 'Rope of Allah' therefore let us seek the Light of Imamat with a greater conviction by becoming more loyal, devoted and obedient spiritual children of Noor Mowlana Shah Karim Al-Hussaini Hazar Imam (a.s.). Let us aim for this especially in this year because Imamat Day falls in the month of Holy Ramadan. 'Ibn al-'Arabi's Metaphysics of Imagination: The Sufi Path of Knowledge', written by William C. Chittick. This book was published by State University of New York Press, Albany in 1989. 'Contemplation and Action' which is the spiritual autobiography of a Muslim Scholar, Nasir al-Din Tusi. The book is edited and translated by S. J. Badakhchani and was published in 1999 by I.B. Tauris, London in association with IIS, London. 'Shi'i Interpretations of Islam' — Three Treatises on Theology & Eschatology. Edited and Translated by S. J. Badakhchani. This book was published in 2010 by I.B. Tauris, London in association with IIS, London. What is the Science of Self-Disclosure? How is a Perfect Man Created? Why is it Necessary to Recognize the True Imam? What are the Relationships between Knowledge, Submission and Obedience? What is the Status of Your Spiritual House? Part 1: What is the Science of Self Disclosure? God disclosures Himself to a person who started from Shariat, followed the path of Tariqat, advanced on the path of Haqqiqat until he recognizes himself, i.e., his own soul. Then he yearns for knowledge of God and wants to advance to Marifat. However, the knowledge of God is beyond his reach. Therefore, he supplicates to God to open the curtains by unveiling so that he can see Him with his esoteric (inner) eyes. When God hears a very pious person's supplication, He discloses Himself by unveling. Ibn al-'Arabi says "the hightest way to knowledge of God is the the knowlege of self-disclosures" so from this we can understand that God becomes intimately involved in the perfection of his noble servant. The path of spiritual progress and development involves: (1) the creation of human beings, (2) their evolution through faith, knowledge, ibadat, and good deeds, and (3) their re-creation into perfect beings. In the Ismaili Tariqah, the Holy Imam's Noor lights the path of spiritual enlightenment. In the final stages of development, enlightenment is increased by the continual unveiling of the Light of Imamat. This is an unpredecedented blessing. Part 2: How is a Perfect Man Created? "Perfect man is separated from him who is not perfect by a single intangible reality (raqiqa), which is that his servanthood is uncontaminated by any lordship whatsoever. Since perfect man has this high position, he alone is the goal sought after through the cosmos. From the above, we learn that there is a discloure of all Divine names into chosen human beings. Here servanthood, humility and submission become fused with knowlege of all Divine names. From an esoteric point of view, according to Nasir al-Din Tusi, the first attestation of faith (shahadat) for Ismailis is the recognition of Allah through the Imam of the time because Allah says in the Holy Qur'an, 'I will appoint a vicegerent on earth' (2:30). ('Shi'i Interpretations of Islam', p.41). Therefore, we seek higher spiritual enlightenment through the Light of Imamat because each murid's soul is linked to the Imam's soul through the act of bayah. Part 3: Why is it Necessary to Recognize the True Imam? Part 4: What are the Relationships between Knowledge, Submission and Obedience? Part 5: What is the State of Your Spiritual House? 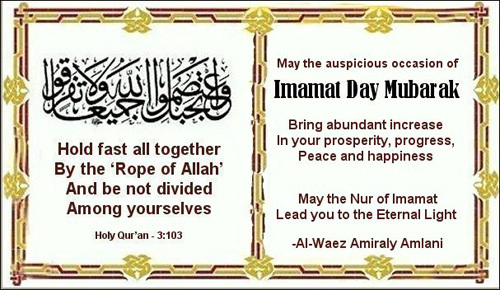 On this happy occasion, let us take time to reflect upon the state of our spiritual houses and tie it to the work of Imamat. On one hand, Noor Mowlana Hazar Imam has and is building architectural masterpieces around the world for the benefit of his murids and humanity at large. On the other hand, in the Spirit World, he is also partnering with staunch, obedient mumins to build scintillating spiritual houses. We need to be certain that our foundation is strong and if there are any cracks in it, then this is a good time to fix them. We need to be certain that the walls of our spiritual house are strong and of even height so that a roof can be placed on the structure. This raises the question of balance and the need of a multi-prong approach so that all the five walls get built simultaneously. The walls also have to accomodate doors and windows in our spiritual house. As the final destination of our spiritual journey is the recognition of the Light of Noor Mowlana Hazar Imam in our foreheads, it is important to think about the transparent, colored glass roof with a dome for our spiritual house. This design would fully absorb the luminous rays of the Noor of Mowlana Hazar Imam. Spiritual experiences such as tears of love for Noor Mowlana Hazar Imam, goosepumps, shivering, shaking and fragrances are signs that the soul is being purified. Let us hope some or all of these happen at the Darbars and in our personal worlds. In addition to this, for the perfected ones, there will be the didar of Light in the forehead. Let us hope and pray that this also happens at the Darbars and in our personal worlds. Please go to the spiritual houses page to see the requirements for your house in the Spirit World and learn about future expansion plans to make it into a palace! This great journey which begins with a single click. Please go to the higher spiritual enlightenment indicators page to conduct a self assessment by answering ten questions. Shukranlillah wal hamdulillah! I bow my head, soul and intellect to Noor Mowlana Shah Karim Al-Hussaini Hazar Imam (a.s.) for sending spiritual and luminous tayid to articulate the concept of building a spiritual house. All praise is due to the Holy Imam, the Lord of the present and the eternal time (Sahebiz-zamani wal asr)!